At the start of April, we called on you to help us find new homes for 250 adoptable cats and kittens by the end of the month. Together, we’ve surpassed this goal, with more than 334 felines adopted so far. With less than three days left of our Adopt-A-Thon, we’d love to see many more adoptions before the month comes to a close. With your help, we’re confident we can reach our new goal of 350 cat and kitten adoptions by April 30! For every feline adopted so far, another has promptly taken up residence in their condo. Our North Melbourne and Campaspe shelters are bursting at the seams with cats and kittens in need of new homes. Today, we want to introduce you to some of our long-term feline residents. Izzy is ready to strut her way out of the shelter and into your lounge room. She’s a people-lover and will happily accept any love or attention you’re willing to lavish on her. 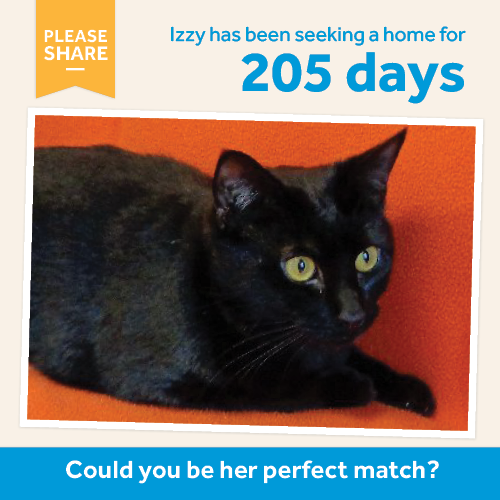 Izzy is not too fond of other cats, so she wants to be the one and only feline in your life. That just means you’ll have more quality time together! Izzy’s lovely nature will make her the perfect family companion. Izzy is up for adoption at our Campaspe shelter. Click here to view her full profile. With her striking eyes, it’s hard to look past Christy. This 14-month-old is always on the lookout for smooches. 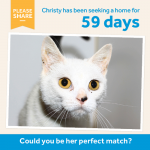 Christy would love to be adopted into a home where she will receive a plentiful supply of pats. With her lovely nature, she will fit right in to almost any kind of family. Christy is up for adoption at our North Melbourne shelter. Click here to view her profile. Roxy is a social butterfly. Whether you’re playing together or enjoying a warm cuddle, all she wants is to be with you. 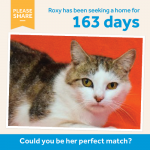 Roxy has an easy-going nature, making her a great match for a family of any size. She has been affectionately nicknamed ‘Rolling Roxy’, because when she was having her photo taken, all she wanted to do was roll around and smooch the blanket! 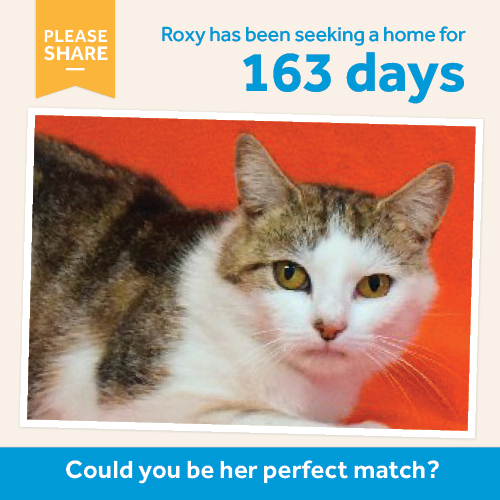 Roxy is up for adoption at our Campaspe shelter. Click here to view her profile. Until this Saturday, April 30, The Lost Dogs’ Home is waiving the adoption fees of all cats six months and older at our North Melbourne and Campaspe shelters. Kittens under six months have their adoption fees halved to $90. All cats and kittens are health checked, desexed, microchipped, vaccinated and wormed, all valued in excess of $300 per cat. Adopt a feline in need of a new home. Foster a cat or kitten who needs some TLC outside of the shelter environment. Know someone who wants a new cat? Tell them about our adoption candidates and why shelter pets make great pets.